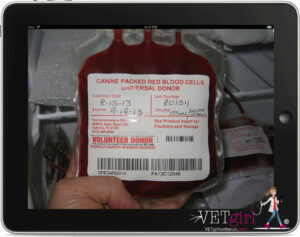 In this VETgirl online veterinary continuing education blog, we demonstrate how to perform an autotransfusion in a dog with a traumatic hemoabdomen. In this video, a 5-year-old pit bull terrier was hit by a car and presented with a severe hemoabdomen. Initial volume resuscitation included fluid resuscitation with crystalloids, colloids, packed red blood cells (pRBCs) and finally auto-transfusion. The benefit of autotransfusion, is that it is a readily available transfusion product available from the patient. As it is from the patient, it will not result in a transfusion reaction. However, autotransfusions should only be performed when there is no evidence of contamination from urine (e.g., uroabdomen), bile (e.g., bile peritonitis), bacteria (e.g., septic peritonitis), neoplastic cells (e.g., hemoangiosarcoma), etc. As the blood has already undergone fibrinolysis, there is no need to add anticoagulants (such as CPDA, etc.) to autotransfusions during collection. Ideally, blood should be sterilely collected in 60 ml sterile syringes. A blood filter should be used when administering the autotransfusion back to the patient. Alternatively, one can collect the blood via a three-way stopcock system and collect it directly into a sterile bag (e.g., a used IV fluid bag). As this dog had evidence of severe hemorrhagic shock that was non-responsive to crystalloid/colloid resuscitation, transfusion with red blood cells needs to be performed immediately. Blood can be bolused in as quickly as needed in severe cases. Remember, our ultimate goal with administration of any type of blood product is to increase oxygen delivery (DaO2) with red blood cells! When in doubt, don't be hesitant to perform an autotransfusion, but make sure you're using the transfusion product correctly and when it is not contraindicated!